It’s not just big companies that are increasingly incorporating contingent labor into their talent management strategies. Small businesses in the U.S. are also turning to freelancers. According to the latest research from LinkedIn, 70% of U.S.-based small businesses (defined as those with fewer than 200 employees) have hired freelancers. LinkedIn’s ProFinder marketplace, a service for businesses to find freelance workers, had seen a rise in small business hiring across all sectors. To better understand this trend, LinkedIn surveyed more than 1,500 small businesses on whether they have ever worked with freelancers, and if so, how often and why. The findings all point to a rise in the use of freelance labor by small businesses that is only going to increase in the future. Among the 70% of small businesses that have used freelance labor, more than half have done so in the past three months. The vast majority (81%) also plan to do so in the future. Moreover, 52% of small businesses expect to work with a higher number of freelancers over the next five years. Satisfaction with the work that freelancers do is also high, with 83% of small businesses agreeing with the sentiment that freelancers and contractors contribute significantly to getting the work done. 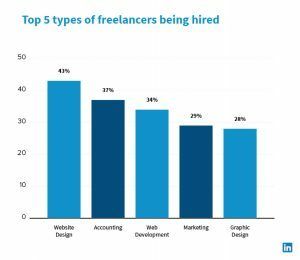 However, as the report notes, the most common reason for hiring freelancers is to fill an expertise gap, such as web development or design. Cost is another major factor, as using freelance labor frees companies up from paying benefits like health insurance. Looking more closely at the expertise gaps that small businesses tend to have, website design ranks top, followed by accounting, web development, marketing and graphic design. The LinkedIn report notes that website design is the most in-demand freelance skill among small businesses, regardless of size. 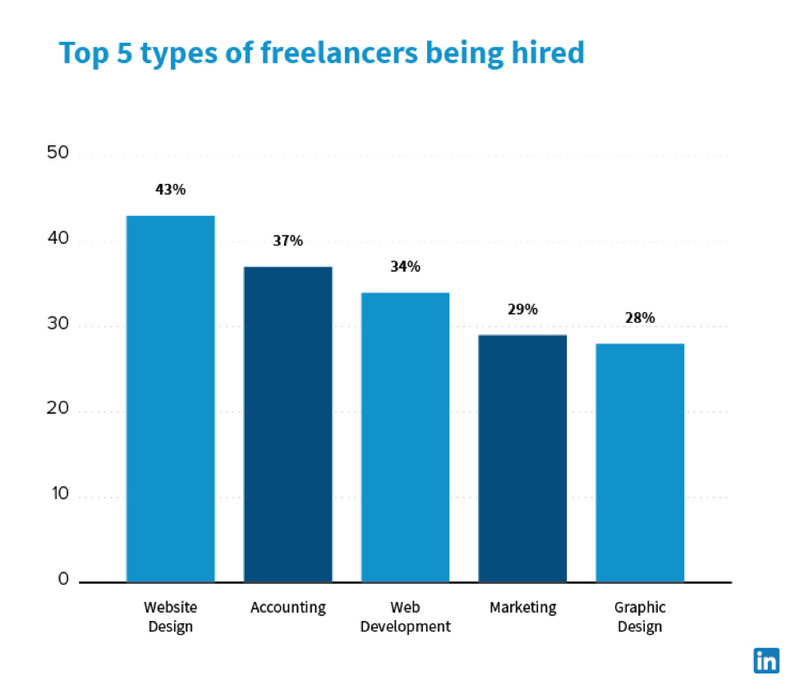 The report also looked at variation in freelancer hiring among nine industries. Small businesses in the education (88%), art and design (82%) and technology (81%) industries are the most likely to have hired freelancers in the past. In contrast, small businesses in the retail (57%), accounting and finance (61%) and healthcare and health services (65%) industries are the least likely. For the 30% of small businesses surveyed that are not hiring freelancers or contractors, the top reason is that they simply do not need freelance labor (61%), while 20% of them cite costs as a barrier.